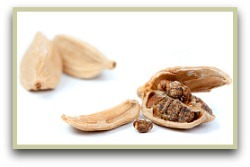 As one of the world's most ancient spices, the history of cardamom is long, dating back at least 4000 years! And as with a lot of spices in those times, it was prized for its medicinal qualities ahead of culinary uses. A document, the Ebers Papyrus, dated to about 1500 BC, chronicles that ancient Egyptians were using it for medicines, embalming and other ritualistic practices. They also chewed the pods to clean their teeth and freshen their breath. 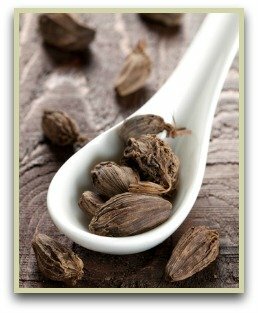 The Greeks and Romans used cardamom spice for perfumes, ointments and aromatic oils. It was also a supposed cure for overindulgence. Read more general information on the black, green and white pods and seeds. It's been used as trade by the Indians for at least two thousand years, and even before then you'll find mention of it in some historical Indian texts like the Taitirriya Samhita which is a political document. Some of these writings date back to the 4th century BC where it's documented as being used for flavourings and medicinal purposes as well as religious offerings. At around the same time, the Greeks were using two varieties from the East which they called amomon and kardamomon. It's not quite clear whether these two are what we today call true cardamom. In Alexandria in A.D 176 it was listed among the Indian Spices liable for duty. A thousand or so years ago, travelling Vikings discovered it whilst on their travels in Constantinople and on the caravan routes. And they introduced it to Scandinavia where it remains popular. Today, Scandinavians use it when making their traditional glogg recipes - a popular mulled wine drunk around Christmas - and also in pastries and meatballs. Whereas in Asia, it's often used to make cardamom tea, a traditional drink with many health and medicinal uses. Click here for my simple tea recipe. ...most of the world's supply was sourced from wild plants found in rainforests of the Western Ghats in Southern India. So abundant were these wild plants, the whole region was named the Cardamom Hills, a name that remains to this day. The first plantations were established by British colonists in the 19th century and this is where a lot of today's green and black cardamom come from. But it's Guatemala, which only started growing the spice in the 1920s, that's the biggest commercial producer today, overtaking India and Sri Lanka. In some parts of Guatemala, it has even overtaken coffee as its most valuable crop! Cinnamon History - Wars, Myths & Legends!